The ultimate, comprehensive guide to creating the kind of radio advertising that produces results for the advertiser...and re-orders for the radio station and/or ad agency. Radio advertising guru Dan O’Day has produced an astonishingly detailed, 7-hour audio seminar on six CDs, painstakingly indexed to maximize your ease in accessing the information you need. The true definition of "Radio Advertising"
Core Message: The life or death of your campaign! Should you mention the advertiser's website? Dan O’Day is widely recognized as Radio's "Advertising Guru," having taught radio stations, ad agencies, and businesses in 37 different countries how to create money-making advertising. He's the person the Radio Advertising Bureau turned to to create the industry's first certification course for copywriters (the CPCC). And with this "ultimate audio seminar" - illustrated with nearly 200 actual commercials - you can have him "on call" 24 hours a day to help you and your staff create the kind of commercial that is a profit center for the advertiser, not an expense! Six Compact Discs (7 Hours) with Binder and online workbook! The key word here is "MAXIMUM"
An invaluable tool for anyone who works in Radio Sales/Production/Copywriting. 'Nuff said. I have owned "Damn the Creativity, Full Sales Ahead," for a number of years. I now know that the lessons taught in "Damn the Creativity..." is like earning an "Associates Degree" in copy-writing. "How to Create Maximum Impact Radio Advertising" is more like earning a "Doctorate Degree" in copy-writing. I HIGHLY recommend this seminar as a way to elevate your copy-writing from average to exceptional. Your clients will benefit from your investment. A New, Better Way of Doing business! Clear, easy steps to follow to create commercials that sell products. I would recommend this product to anyone who works in the business. Everyone who owns or manages a business should hear this message. Just finished The World of High Impact Radio Advertising CD Seminar. WOW! Awesome stuff. Thanks for making things more understandable and giving me new techniques to help my clients! If writing advertising copy is part of your job description and you want the single best, most comprehensive course on how to do it more effectively, the search is over: order this CD set right away! "How to Create Maximum Impact Radio Advertising" is an incredible resource. If you're new to this craft, Dan will help you get started on the right track. If (like me) you've been working in the industry for awhile, Dan will make delicious hamburger out of your advertising "sacred cows" in a completely winsome and compelling presentation. I'm simply not aware of anyone else who brings together so much valuable information on this subject with such a consistently high level of expertise. Order this set, listen and be inspired to create advertising that works! How to do radio advertising the right way! "How To Create Maximum Impact Radio Advertising" is an excellent program that should be a prerequisite for all radio salespeople...all media salespeople for that matter. The techniques that Dan teaches in this comprehensive program are not fluff or theory, they are the essentials necessary to make a radio (or television) commercial actually work! And he provides plenty of specific examples showing you how it's done. For longer than I care to remember I have detested the usual radio sales management focus on closing techniques and silly comebacks we were taught in a attempt to "trick" clients into buying. Stop stealing your clients' money and show them how to make their advertising generate a measureable return-on-investment! Not to mention a bigger commission check every month for you too. I only wish this was available thirty years ago when I started selling radio commercials! Dan always delivers, when it comes to creative. He has a keen sense of what is the correct thing for copy. This library is just one more example of Dan being able to deliver what is needed to help make a difference for clients and the station. I was a producer and I loved my job. I got to play with sound all day and they gave me a paycheck every two weeks. I didn't think it could get any better. Then I found this seminar. Actually I went to see Dan present it live in Toronto and Jim Waters purchased it for all CHUM stations as a follow up. It was a true "Jimmy" moment. In the middle of Dan's description of the 6 CD package, Jim said "I want a copy for every station that is here and you can send the bill to me". What a guy! Dan taught me how radio really worked. He made me truly understand my craft. This seminar made me a better producer and, when I was promoted to lead the creative department, it served as the basis of our vision. I still listen to it every 8 months. Every time it gets me excited about what we can really do with radio. I'm writing better copy now. That's it. O'Day teaches copywriters to do what Robert Collier taught: It's all about getting into the conversation that's already going on in the prospect's head. Instead of just screaming at prospects, this breaks down the way to accomplish persuastion, step by step. Plus - it's fun listening too. Another point - he really helps you weave in the all important STORY, something that's a challenge for many (me, especially). Year after year, Dan O'Day passionately advocates for the power of radio. In this course, he takes us from the basics to the master class - revealing and explaining how to make radio live up to its promise as the most compelling ad medium ever invented. Feel like you're "not at all creative?" Dan's systematic approach will enable you to find and mold the ingredients of successful radio ads. Master this - and you'll definitely enhance your client value. 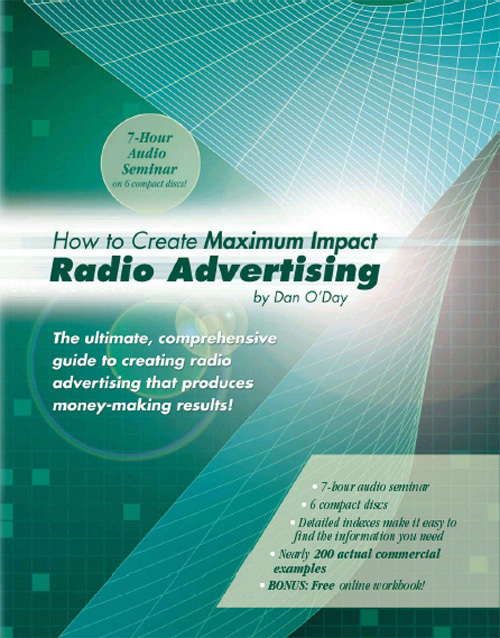 I strongly recommend Dan O'Day's HOW TO CREATE MAXIMUM IMPACT RADIO ADVERTISING. Click the button below to add the HOW TO CREATE MAXIMUM IMPACT RADIO ADVERTISING (6 CD Set) by Dan O'Day to your wish list.